I primarily work with manual focus lenses on the compact NEX-7 body. 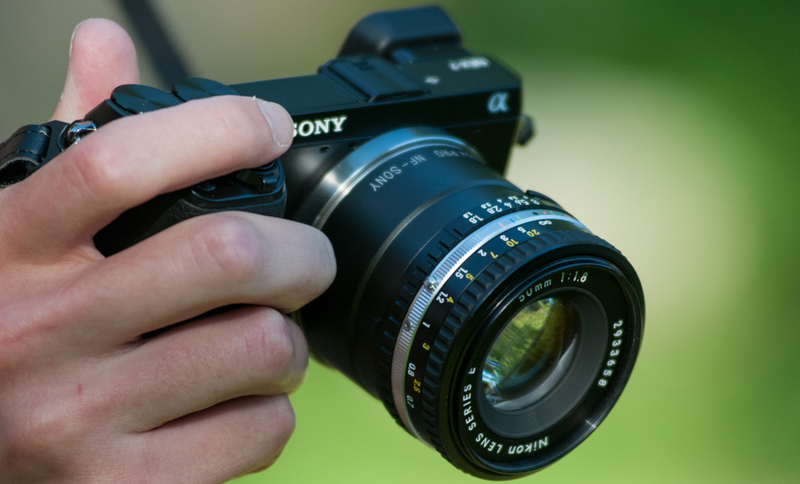 Combined with the excellent 2.4 million dot EVF and precise peaking and magnification functions, shooting with manual focus lenses is easier and more accurate than it could ever be on a typical SLR camera through an optical viewfinder. Hey Matt, I’ve been enjoying your Nex 7 DPR posts! I seem to be in the minority of thinking the 7 is good at high iso. Maybe my camera is faulty. Could I send you or someone who you think would be better a couple of high iso photos to compare with your camera? (I’ll be away for 4 days and won’t be dealing with this between then). Hey there Keith (reason I’m just now replying is my previous comment didn’t actually reply to you, the site glitched), it’s been a pleasure helping people out on DPR, glad I could link you to this site. And yes, we are definitely in a minority on the high ISO “issue” with the NEX-7. I’d be more than happy to see a few test shots that you send me with high ISOs so I can compare them with mine to make sure your sensor is okay. Email is mwdurr@bellsouth.net. Keep in mind the email size is limited to 25MB, so you may be only able to send one or two pictures at a time. Specify in your email whether or not the pictures were taken in RAW and exported to JPEG, or are just straight out of the camera JPEGS. However, I have a pretty strong feeling your camera is fine, however, your problem is that you are looking at your photos at 100%. When you compare another camera like the 5n with the 7 at that magnification, the 5n will ALWAYS look better, simply because the 5n has less pixels packed into the same space, hence they are bigger, and can accept more light without noise. Here’s the neat thing though, when you downsize the NEX-7′s 24MP files down to 16MP (like the 5n), the difference between the two is completely negligible. What this means is that at low ISOs (think 100 to 400), you get the benefit of super pixel-level detail, and at high ISOs, you’ll know that in actual use with printing or downsizing for web-use, it does just fine. Good question. In RAW mode, the NEX-7 can only shoot at 24MP. In JPEG mode, it can shoot at large (24MP), medium (12MP), or small (6MP). The camera takes the 24MP file in each case, and downsizes in-camera. In order to downsize a picture to 16MP, you can first import the image into Lightroom (or a photo editing program of your choice), and then export it with dimensions set to 4896 x 3264 (this is in the 3:2 ratio). The exported image will be 15.98 megapixels. Matthew, saw your pics on the Nick Exposed Quotography project – well done. Enjoyed the Oscar Wilde ‘be yourself’ quote picture. I do nott have one yet for this. May try to create one over the weekend if I have any time. Hoping it gives people the motivation to just “get out there and shoot”. Thanks Jaclyn! Hi there Matt, I recently got a NEX-7 myself and was very interested in the way you are using yours with ‘vintage’ nikon lenses. Can I ask what adaptor you are using? does that same adaptor work for all Nikon lenses? Hey! Congrats on the new camera, and thanks for dropping by the site. As far as the adapter, I use the Fotodiox PRO Nikon F to Sony E. got it on sale at Amazon for $50, and I’ve mounted/unmounted lenses hundreds of times already, with no real signs of wear or play. It works with all lenses that have an aperture ring. Modern lenses, such as any of the “G” Nikons, are stuck at minimum aperture. Jeff (a friendly rep from Fotodiox) told me a while back they are developing a PRO adapter with aperture ring. I don’t know the progress of that, so you may want to drop them a line. Hello Matthew I too use N7 but with used CZ and Voigtlander the results are very satisfactory. Recently ventured into Pentax M42 mount. Used Nikon lenses are still beyond my financial reach however maybe one day I’ll get a 180mm 2.8 please keep shooting and look forward to more encouraging photos from you, thank you. 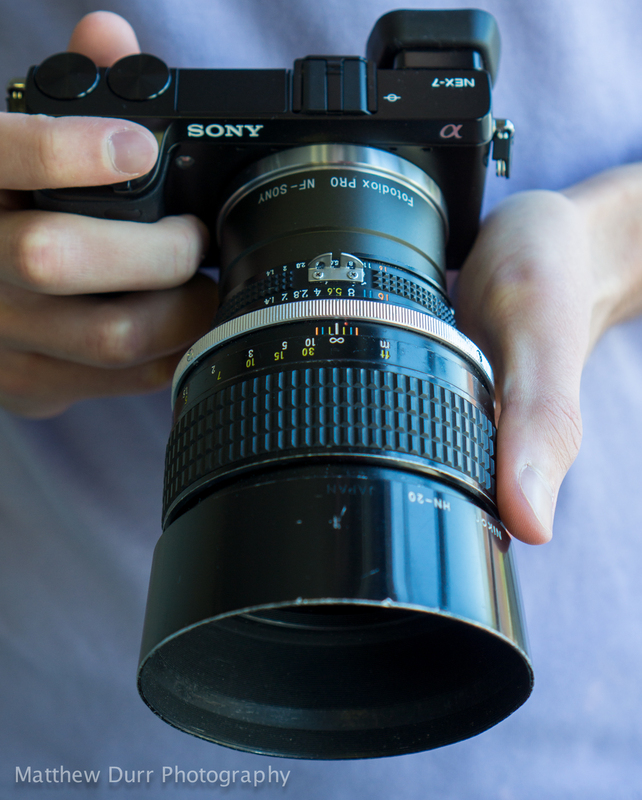 you’re getting some great pics with MF lenses – nice work! I’ve got a few Voigtländers (35mm f1.4, 75mm f2.5), Nikon AI-S and Pentax SMC Takumar (50mm f1.4, 105mm f2.8, M42) that I use with a Micro Four Thirds GH2. The NEX-6 has me intrigued, though. Check out KEH. Some of the slightly slower lenses go for much less and are smaller/lighter, too. 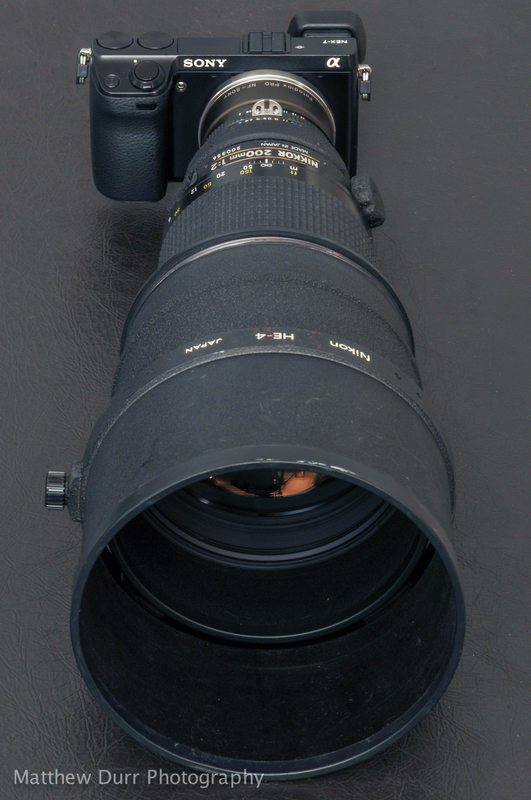 I got a few Nikon AI-S lenses from them; 105mm f2.8 macro, 200mm f4 IF macro, 300mm f4.5 EDIF. All were about $300 each, rated BGN. Hey there Jeff, seems you have just about a complete set on your GH2, I’m assuming you are meeting your wide needs with native lenses. KEH is a great place to buy lenses, I just keep forgetting to check there for some reason (eBay is always the first place I go! haha). I wish they still did lens repairs. Matthew, I got a question regarding manual focusing lenses. Do you get AF confirmation in viewfinder (like blinking dot or so)? The manual focusing seems to be extremely difficult without AF confirmation. On legacy lenses, my autofocus confirmation is using the focus peaking feature combined with shooting RAW in black-and-white creative style (only the preview is black-and-white, uploading to computer it is color again). The peaking color I use is yellow on mid (when shooting with viewfinder) or low (for LCD screen shooting). 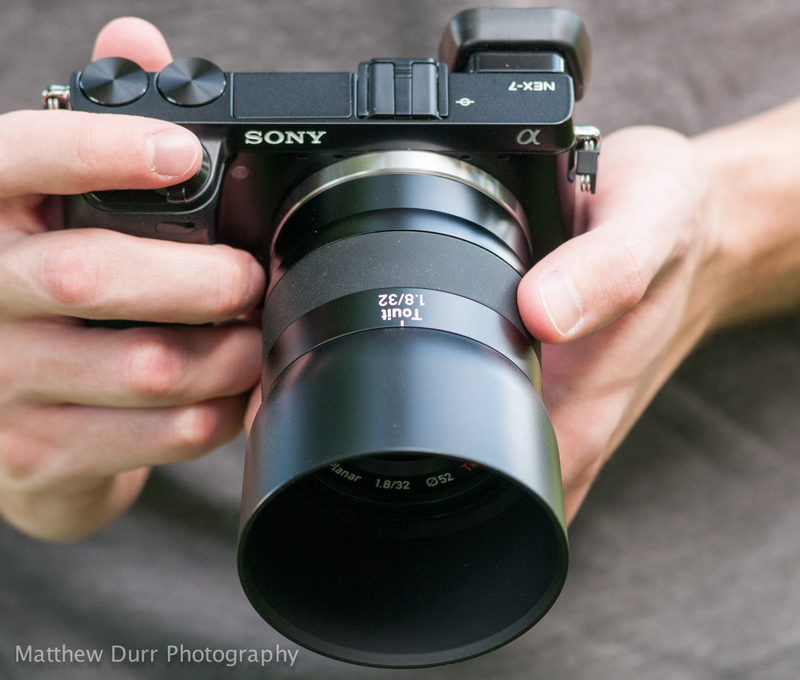 For manually focusing E-mount lenses, I pretty much just give up, it takes too long (see my 35mm f/1.8 OSS review). However, if you are talking about manually focusing Nikkors on a Nikon DSLR, I use the little focus confirmation dot in the lower corner. It’s not too accurate, but it generally works at most apertures. Very informative and useful information. Thank you very much! I forsee a NEX in my future. I will be waiting to see about the full frame if it indeed happens. Currently shooting a Nikon cropper with a couple of manual lenses. 2 of my bargain favorites are the 75-150E and 28mm 3.5 Nikkor. Total investment was under a hundred bucks. For both! Have you experienced them? Thanks again and keep up the great work. Great to hear! I have actually reviewed the 75-150mm (check my review page) and thoroughly enjoyed it for the zoom it was. 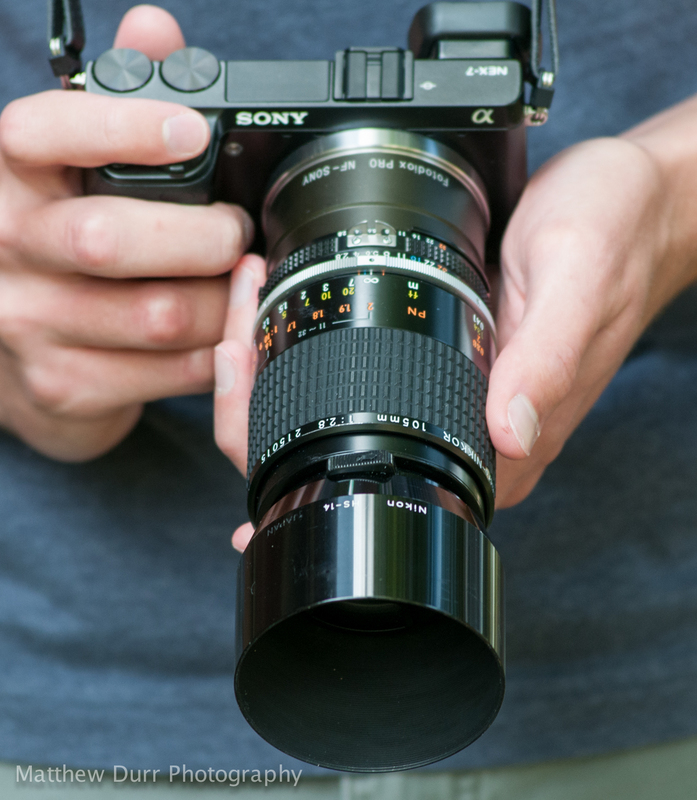 I have also reviewed the 28mm f/2.8 E, but not the f/3.5 AI version you have. Seems like a nice lens as well, though I’m not much of a wide-angle guy. 🙂 Keep an eye out in late September, there should be a big announcement on the way!